UrbanShield 2104 came to Oakland, California on September 4th, and Vidcie was there to demonstrate the benefits of real-time streaming video to the attendees. 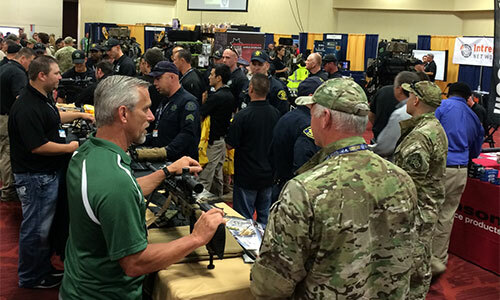 Originally created as a multi-day training exercise for law enforcement and military personnel, the event has expanded in recent years to include a technology expo where new and exciting products and services are on display. It was here that Vidcie set up shop and gave live demonstrations of Vidcie Live Video Assist. During the two day expo, we were able to meet with police officers, military personnel and government security agents and discuss the details of how Live Video Assist will help to increase situational awareness in the field and aid in covert surveillance operations.While the concept of body mounted cameras was nothing new for the attendees of this event, typical video offerings in this arena are designed for in-camera recording and are only useful in looking back at an event that has already occurred. Vidcie, however, feels that real-time video provides an additional dimension to team communication and the possibility of a field officer streaming live video from a mobile camera was met with a great deal of enthusiasm. Clearly, individuals who enter the world of law enforcement and public safety hold teamwork in high regard, and they saw Vidcie as a natural way for teams to enhance their communication on a daily basis.